I mention the mystics: Saint John of the Cross, Meister Eckhart, Ruysbruck..., and ask him if he ever rereads them, if he likes the spirit of their writings. -- Yes... I like... I like their... their illogicality... their burning illogicality... that flame... that flame... that burns away filthy logic. Book ends? Do you mean at the end of the text or while it stands on the shelf? These are the final words in the book . ... but it still carries on on the shelf... srange notion..
"but it still carries on on the shelf"
Only if the ink runs. I was just thinking today, reading some Isaiah( there's powerful gems in there, but I admit I found much of it a pretty tedious- the limitations of the diatribe), how would he fare, I wonder, with such luminary bodies as the Anti-Defamation League. He would of course be the most reviled of Jews. The burning illogicality, etc is excellent. The poetry of someone like Gerard Manley Hopkins something similar, where the synaptic, rational flow is deliberately sabotaged, or perhaps incidentally sabotaged- it's not a rational process!otherwise it would be an example of the dead rationality it is sabotaging. That's why the idea of something like utilitarianism is so depressing to me- the self yoked to a chain of logic, a slave to rational processes. A slave to an instrument of one's mind. Just to be sure: those are the words of Beckett, and not of van Velde? Qlipoth, they are Beckett's words. 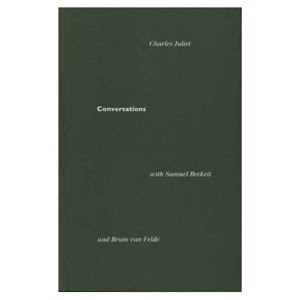 The cover of the book suggests Beckett's conversations are first but they're not. The bulk of the book is van Velde with Beckett at the back. One day, suddenly, it dawned on me, dimly, that I might perhaps achieve my purpose without increasing the number of my pockets, or reducing the number of my stones, but simply by sacrificing the principle of trim. The meaning of this illumination, which suddenly began to sing within me, like a verse of Isaiah, or of Jeremiah, I did not penetrate at once, and notably the word trim, which I had never met with, in this sense, long remained obscure. Beckett reworked a lot of his writing with the musical phrases of the King James bible very much in mind, according to Knowles anyway. I think that's why I find what I've read of him so accessible - that tonal music is embedded inside these apparently bleak and cold pronouncements, burning away as much filthy logic as it can. Like liquid nitrogen. That's a weeny JPEG you got there, Stephen. I had to read the comments to find out what the book was.